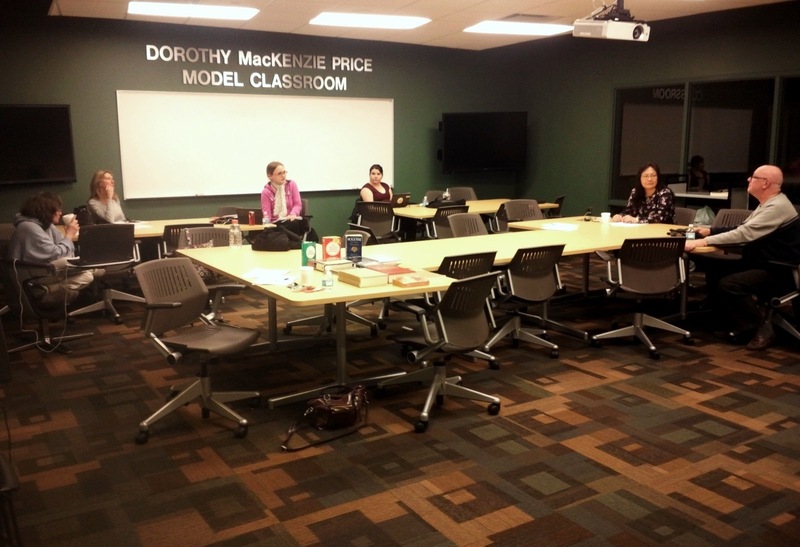 Aspiring novelists will wrap up their month of intensive writing by celebrating with their fellow Wrimos on Monday, December 1 in Carlson Library. “Winners” will be those who actually reach the 50,000-word goal by midnight tonight (November 30). But everyone who signed up this year is welcome to help us join in the celebration! Here’s how a few participants spent the last Write-In session just before Thanksgiving. Among other things, Dr. Glenn Sheldon (Honors College) emphasizes the importance of character-building in the novel-writing process. 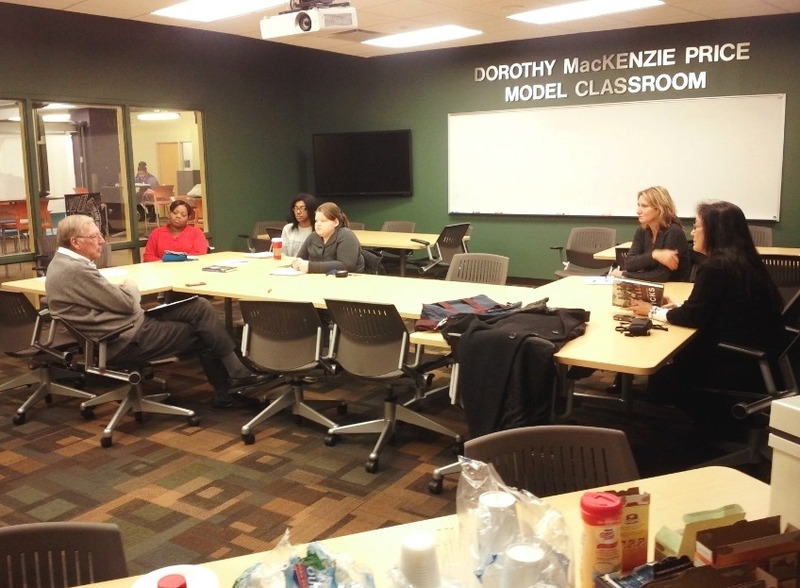 Former provost to provide insight into noveling this week at Carlson! Former UT provost, William McMillen will be our special guest at this week’s NaNoWriMo Write-In session, Tuesday, November 18. William McMillen has published both fiction and non-fiction. In addition, he has self-published a series of Christmas books for the past five years that have been privately distributed to friends and family. He has been told that all of his writing is brilliant (but he’s heard that mostly from friends and family). Nevertheless, he promises that if you listen to him closely, you will have your novel published within weeks, a month, or maybe two or three years. He will share with you secrets about writing and publishing your novel that you’ll never hear anywhere else! But you’ll be sworn to secrecy, so you’ll have to show up or you’ll be literally left out in the cold. 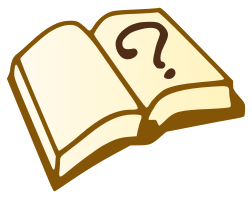 And, to end an invigorating half-hour talk he will answer the following question that you’ve all wondered about: Why is the beginning of a novel usually better than the end of a novel? If you can, please stop by and see our special guest, Bill McMillen — whether or not you are a registered “Wrimo” this year! Former UT Provost Bill McMillen engaged a small group of interested “wrimos” earlier this week with his tips on writing and publishing. 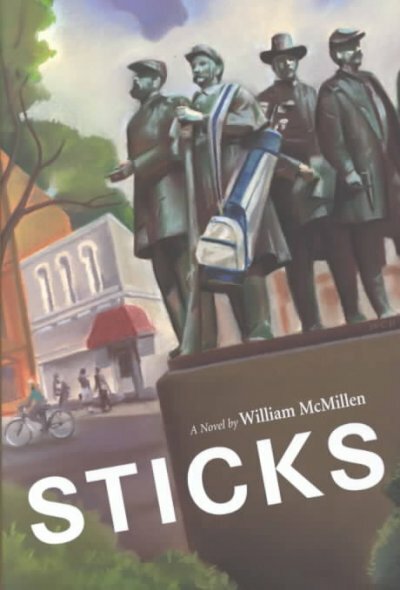 Participants enjoyed learning what was behind his novel, Sticks. P.S. We had a great time with guest Susan Parks last week. Please see my special update on that post. “Wrimos” (AKA budding novelists, as known in the NaNoWriMo world) will get the chance to meet with novelist and UT faculty member Susan Parks this Wednesday evening, November 12, at Carlson Library’s third NaNoWriMo “Come Write-in” session. Ms. Parks will briefly share her experience writing and self-publishing, and will welcome questions from aspiring novelists in attendance just before they get down to their own writing. Susan Parks is a lecturer in literacy education at The University of Toledo. 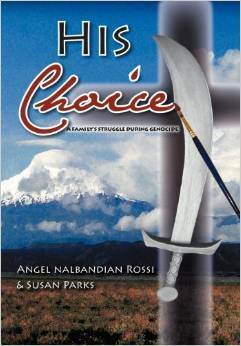 Throughout her childhood, she heard stories of her great grandparents in the Armenian Genocide and was inspired to write the book, “His Choice.” Captivated by her heritage, she studied the history of Armenia and the genocide in preparation for writing this historical novel. Set in 1915 during World War I, the story chronicles the events of four orphaned sisters and their perseverance, determination, and struggle to survive. Through numerous twists and turns, this heart-wrenching story has an unexpected ending. 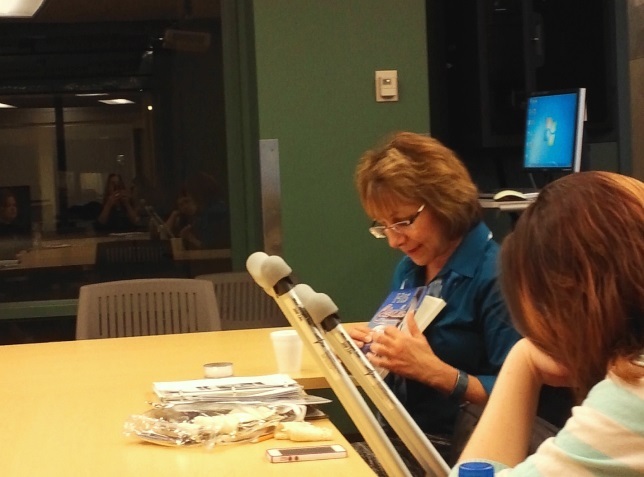 UT Lecturer Susan Parks shares her novel — along with some artifacts — with Nanowrimo participants last week. Her historical novel is based on the harrowing, true experience of her family during the Armenian genocide, 100 years ago. The Library will bring in two additional “special guests” to round out the remaining weeks of NaNoWriMo. If you have a chance, please feel free to stop by and say hello to all of our special guests — even if you are not signed up as a Wrimo this year. Got a reference question? We can help! Used under Creative Commons Attribution-Share Alike 3.0 Unported license. Image attributed to Forrestjunky. The secret to academic success lies in the Library! Our librarians also provide one-on-one research consultation by appointment. Additionally you can chat with a librarian using our instant messaging service, or contact a subject librarian by phone or email. Visit our Reference Services LibGuide for more information. We hope to see or hear from you this semester! Be inspired, be creative. Celebrate National Poetry Month! 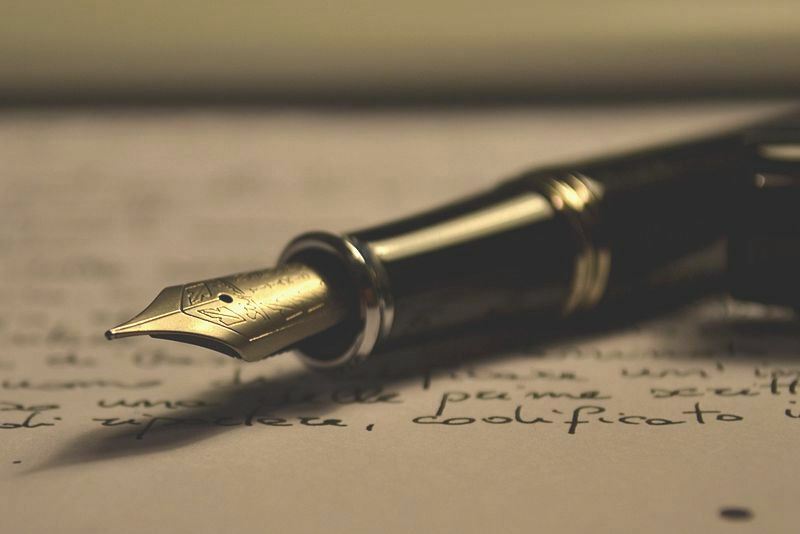 Just in time for National Poetry Month – find open access poetry journals all in one place in a new, custom e-collection at the University Libraries! From Abalone Moon to Valparaiso Poetry Review, you can now enjoy over sixty (60) open access poetry journals anyplace, anytime. Open access (OA) means that no paid subscription is required and typically no login restriction is imposed. While there may be no subscription cost, please be assured that these journals are part of EBSCO’s database of thousands of OA journals not only because of their commitment to the OA sharing model of publication but also because they operate under the same rigors of research and scholarship as other academic journals. While these journals were previously available in our EBSCOhost database of OA journals, they were not easy to locate by subject until our cataloging department worked with our e-journal management vendor (EBSCO) to make this easy, custom collection of poetry titles possible. Alternatively, you can also find OA poetry journals by doing this search in our catalog. Take some time out from studying today to enjoy browsing these journals! You may even find an opportunity to submit a work of your own. For more on poetry, please visit our English Literature LibGuide. Last month the University Libraries conducted an institution-wide OA survey. We are very pleased with the number of responses received. At this time we would like to share our preliminary results set with you. We will offer analysis of some of our findings shortly. We’d also like to announce the winners of our drawing for several Starbucks gift card/insulated cup packages: Erin Crawford, Dr. David Nemeth, and Dr. Stephanie Hughes. And we thank everyone again for their participation! Although the annual Open Access Week is several months behind us, the University Libraries is interested in keeping the conversation on open access going. Just over two years ago the University Libraries conducted a survey to gauge UT’s institutional perception of and experience with the open access (OA) publishing environment. If you are a faculty member or researcher, GA or TA, we would like to invite you to participate in our NEW follow-up survey. The IRB-approved survey (which takes about 10 minutes to complete) asks first some basic questions about your understanding, views and experiences with open access research and publishing. The second part of the survey asks your opinions on the best use of an institutional repository. The “institutional repository” (or IR) has become the preferred scholarly publishing and digital curation tool for researchers at universities worldwide. It serves both as a storehouse and a showcase of the intellectual and creative output of an institution: from faculty research articles and data sets, to student theses, dissertations and projects, to media and grey literature, conference presentation files, and more. The IR can even serve as a publishing platform. The University Libraries will soon be launching a brand new IR and so we would like to have as much feedback as possible on the best way to maximize its value and impact. If you would like, you can read more about repositories here. So if you are a faculty member, GA or TA, please consider taking the survey! Upon completion of the survey you may opt in for a random prize drawing. Thanks. UPDATE [3/2/14]: Survey is now closed. Thanks to all who participated! 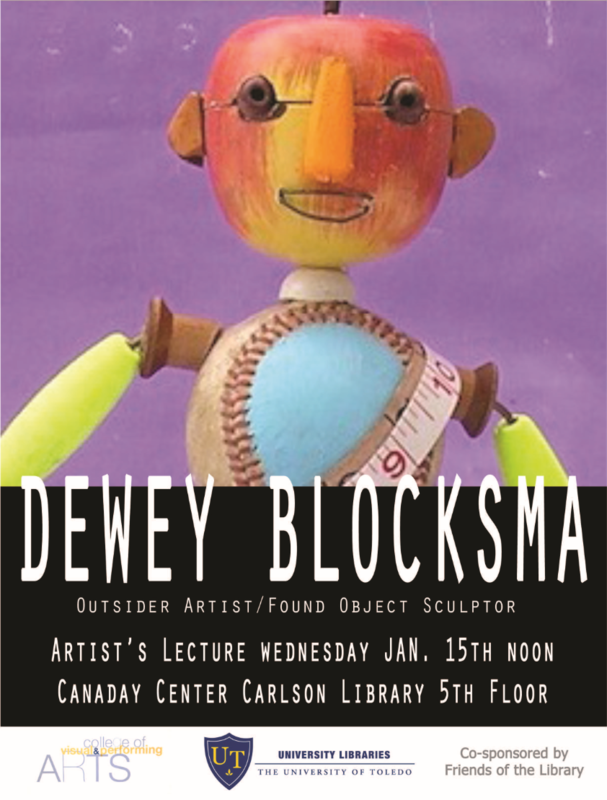 Please join us Wednesday, January 15 at noon when the Canaday Center in Carlson Library will host an interesting art lecture with the UT Art Department’s visiting artist Dewey Blocksma, a former emergency room physician and local outsider artist who has become renowned for his creative and imaginative work with found objects and repurposed materials. Learn more about the artist. The lecture is co-sponsored by Friends of the Library. Please contact us using the phone number, email address or chat box found at the lower left of our main page and a librarian will assist you. For more information you may also want to check our reference libguide. Reference hours will return to a full schedule beginning the first week of classes, Spring Semester. The University Libraries’ online catalog and remote database access will be unavailable on Monday, December 16th from approximately 11 AM to 5 PM. * We will be performing critical server maintenance and apologize in advance for any inconvenience. During this system downtime, you will not be able to request OhioLINK books or access research databases. If you need help with research or need to check out a book, please see a library staff member for assistance. *Please check periodically throughout the day to see if systems are back up and running earlier than expected!